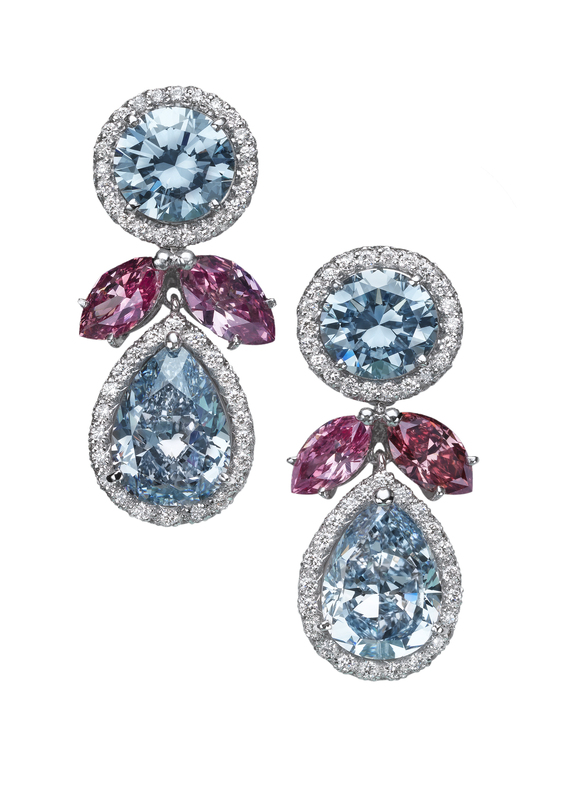 Moussaieff – Natural Fancy Blue and Pink diamond earrings, with 7.60cts of Fancy Blue and 2.05cts of Fancy Pink, with 0.95cts of white diamonds. Burst of colours, fine design, the highest in craftsmanship and the rarest among gemstones: this is the House of Moussaieff. New high jewellery creations signed Moussaieff Jewellers, one of the most discreet and exclusive high jewellery maisons in the world and founded almost two centuries ago, have highlighted Paris during the Haute Couture Fashion Week. Stunning creations that are born out of the most diversified sources of inspiration: the organic forms of the natural world and the animal kingdom, as well as the symmetries and brilliant palette of the art and architecture of the Silk Road or, again, the charm of a jewel coming from the past – as it is the case for the fabulous titanium, diamond and Paraiba tourmaline Peacock Feather necklace, which recalls a similar brooch designed for the Empress Eugenie, wife of Napoleon III, in 1868. Moussaieff – Feather with Diamonds and Paraiba Tourmaline. Natural non-heated vibrant neon-greenish-blue Paraiba tourmaline of 57.21 carats, showcased in a diamond-set feather weighing 56.35 carats. Set in titanium. A perfect balance between idea and execution that always pays a profound respect for the great gemstones that are the protagonists of these great jewels by guiding the design of their lines. This is also one of the reasons why Moussaieff Jewellers’ creations never go out of style, and are passed down from generation to generation. Moussaieff – Yellow diamond, diamond and ruby brooch. Moussaieff Jewellers’ new high jewellery collection is punctuated by exceptional creations, expressing themselves with sensuous lines and delicate tones, thanks to the use of Fancy Pink diamonds and natural pearls. Or else, with the classic elegance of white diamonds and the saturated hues of Colombian emeralds and Burmese sapphires. With its long and distinguished heritage among connoisseurs who know and love high jewellery, Moussaieff Jewellers is acknowledged as a leading player in the world of exceptional gemstones. A reputation built in time, thanks to the constant search for rarest and most valuable diamonds, rubies, sapphires and emeralds. Let us just remember that Moussaieff Jewellers has, among others marvels, the Moussaieff Red, which with its 5.11 carats, is among the largest Natural Fancy Red diamonds ever seen. Moussaieff – Moi et Toi ring. Moussaieff – White gold natural pearl and diamond earrings and necklace. With 11.43 carats of natural pearls in the earrings and 108.81 carats in the necklace. Moussaieff – Natural Burma Sapphire pendant. With a natural Burma sapphire of 91.38 carats set as a brooch/pendant, with yellow diamonds and emeralds and white diamonds for the necklace. The creative soul behind these masterpieces is Alisa Moussaieff, and for her designing jewellery is an intellectual journey, playful and serious at the same time.